and Rights to all content present are strictly reserved! One might question the wisdom of putting up examples of game work done over fifteen years ago in a modern portfolio site. Nostalgia? Stupidity? 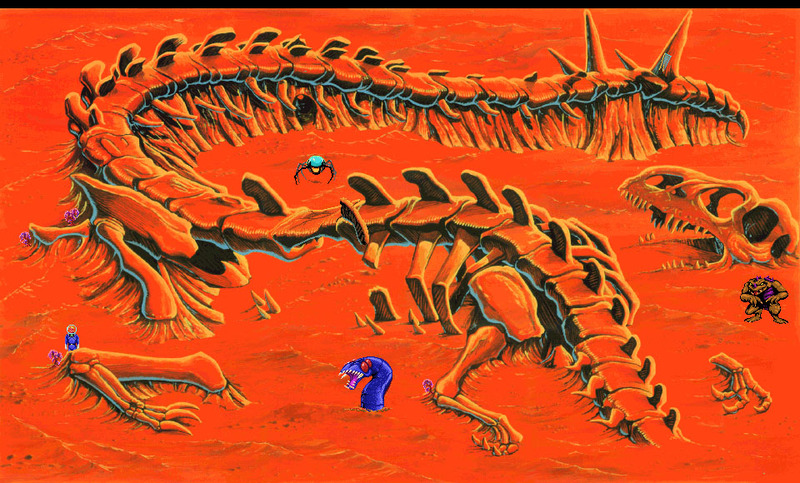 This was my final project for Sierra On-Line, I was given the task as Director to adapt the original EGA 180x200 Space Quest I game to 320x200 VGA color. I was given a total free hand, as long as it was on time and on budget and relatively true to the original. I had a lot of fun with this. I went for a retro-fifties EC comics look, with Wally Wood being my inspiration. Alas, many of the backgrounds were painting in Korea, and the quality was very inconsistent. Most of the backgrounds here were painted by my team, and the nine-screen scroller to the right was mine. My animation team did a great job and we added a ton of new visual gags and easter-eggs to the original story. The post-mortem on this game was also a career high, the game shipped ahead of schedule, under budget, and with no overtime required for any of the team. As did my two previous games at Sierra "Mixed Up Fairy Tales" and "The Castle of Dr. Brain". I had the Sierra SCI process down pat. Great team, fun project.